In general, finding the best car camping mattress is just as difficult as choosing the best air mattress for camping outdoors. This is because there are the same things you have to consider such as durability, comfort, size and so on. How do you choose which car camping mattress to buy? Well, after 9 of the best and most common models to the test of relentless camping for months, it finally paid off. I mean now, I have a good idea of what are the best choices for car camping mattresses. Therefore, let me lead you through a process of narrowing down the field for your own needs. Besides, I will also give you some reviews of the best products. Remember that the easiest way to choose a car camping mattress is by setting some criteria for it. It is also about how and where you are going to use it. This way, you can simply narrow down the selection. Let’s get started. To be honest, this is the most important factor when choosing car camping mattress for a camping trip. If the mattress is not comfortable, then a camping cot would be better. I mean, you are going to go camping and relax on the mattress at night, not torture yourself, right? Whether a mattress is comfortable enough or not weights it about 40 percent overall. In details, comfort is a subjective factor, some like a very firm sleeping surface while some others prefer a fluffy down pillow top to sleep on. Therefore, it is highly recommended for you guys to buy a mattress that allows you to adjust the firmness easily. Moreover, you should also take into consideration whether the mattress can hold its air all night or deflate a bit over time. Additionally, there should not be a chance of pressuring through the ground. This is the second most important factor to consider when buying a car camping mattress. In details, this factor weighs it about 20 percent of the product’s final score. Do you enjoy wrestling with deflating as well as packing up a big air mattress when you want to get out of the camp? Also, no one wants to spend hours on blowing up a huge air bed manually with the power of their lungs. This is not a very easy task, even for an experienced camper. Generally, considering the ease of use of a camping mattress is to see how easy it is to set the mattress up, inflate and deflate it. Also, how long it takes to stow the mat away in the morning is important here. To test this metric, I used each of the mattresses sometimes in different circumstances, and then I set them up at the same time. In this way, I could carefully analyze the nuances between them. It was apparent which mattresses were able to inflate and deflate quickly. I also know which one I spent more than 10 minutes wrestling with. Therefore, I suggest you buy a camping air mattress that is very simple to roll out, quickly inflate and deflate and then roll up again. Besides, an air bed with a battery operated inflation pump is also a good choice. This is because it is very simple for you to set up and take down. Do not choose a mattress which cannot inflate itself quickly. Otherwise, you will have to wait more than even 10 minutes for the self-inflating feature to complete its job. Keep in mind that a manual pump will require a lot of time to inflate the air mattress fully. With a synthetic insulated sleeping bag or goose down around you, this is not an important factor. However, what about underneath you, where your body crushes out the heat-trapping loft which is crucial to keep you warm? Even though the thermal properties of your sleeping pad are commonly overlooked, they play an essential role in how warm you’ll feel. Warmth is extremely important when you are sleeping out in the wilderness. Are you convinced yet? Then how about you try sleeping outdoors with 8 inches of un-insulated 40-degree air under your body and enjoy that feeling. Trust me; you never want to do that as I already did this myself and it was not a very interesting experience. Specifically, to rate for warmth, I started with my own anecdotal experiences. However, you should know that feelings and memories are not enough to truly indicate which camping air mattress is the warmest for you. That is the reason why you also need to rely on the stated R-values of manufacturers. Overall, just remember that the larger the number is, the greater ability the material has to insulate against cold as well as heat. By relying on the number, you can choose the warmest and the most insulted car camping mattresses for your camping trip. Also, with this number, you can easily avoid buying a cold and little-insulted air bed. Remember that this type of air mattress will cause you to suffer out there, even on a hot summer day. Overall, I weight versatility as 10 percent of a product’s final score. Specifically, versatility is a metric which takes many different things into consideration, including some of other things I rated for. In brief, the most versatile mattress is the one that best answers the following question: Can I use this mattress right now, no matter what activity or season it is? Based on the question, you can easily find out the best car camping mattress for yourself. Just choose an excellent case for answering the question above with a “yes.” Remember that a versatile mattress should have the ability to pack down easily into a small bag, thus, you can carry it around with ease. Also, the setup and take down should be simple enough and there must be good insulating properties. Also, a good air bed should be one who can separate into a lightweight, compact, backpacking sleep pad. Anyways, I suggest you choose a product with straps specifically designed to help marry two single pads together, forming one. From the description above of what a versatile air bed has, I’m sure you can figure out what the opposite end of the spectrum is. In fact, a non-versatile camping mattress is heavy, bulky, un-insulated, difficult, and so on. Thus, you need to consider whether activities, as well as conditions, are suitable for bringing the mattress. So many people only want to buy one, not to think too much. Keeping mind that you need to avoid buying a mattress that depends on various methods of electrical, mechanical inflation systems or battery too much. The last metric you need to take into consideration when buying a car camping mattress is its packed size. Even in your car, there is only a limited space. Therefore, you may not lug all of your camping gear in there, especially when you are not camping alone. It is a good idea to expect that the pinnacle of luxury will not pack down to the size of a jar. However, you should consider how large of the mattress you can bring. This is the reason why I once tried lining all the mattresses in their stuff sacks up side-by-side. And then I rated them based on which was the smallest (good) or largest (bad). Of course, if you want to compare their packed sizes, the only way to do that sees different images with different measurements. Thus, you should read as many reviews as possible before you decide to buy any mattress. Don’t you forget to consider this factor? If you don’t, then it will be a very big mistake even though you’ve already considered everything else. The price of a mattress can range from $120 all the way up to $400. To be honest, this is a large range. And you may think that the most expensive will the best one. Well, it is not always true. Product is the best only when it can both meet your needs and fit into your budget as well. That is the reason why besides considering the warmth, comfort, versatility, and so on. You also need to consider how much you want to spend. If you are looking for the best car camping mattress and money is not a problem, then just choose an expensive one which meets your needs. This is because, the more expensive, the higher quality. However, if you can’t spend up to $350 for a product you like, then choose one that meets as many of your needs as possible. This Exped Mega Mat 10 is one of my favorite car camping mattresses. It is a mega-sized and, more importantly, a self-inflating mattress which rates at the top of the pile regarding warmth and comfort. In details, while some of its attributes are not as convenient and versatile as other products, comfort is also the most important factor, isn’t it? That is the reason why this product stands out. While most camping mattresses feel like camping pads, this one feels like a memory foam mattress. Additionally, 4 inches of foam filling will insulate from the cold ground as well as support your pressure joints. 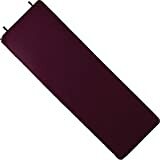 This one can also protect you from the dampening the “riding on air” effect of all air beds. Honestly, with a retail price of $219, this one is not a very cheap product. However, it is worth your money. This product is super comfortable for different uses, including sleeping in cars. Nonetheless, you should know that this product is quite heavy and bulky for backpacking. That is also the only downside of this mattress. – It provides you great comfort. – R-value of 9.5 is extremely warm. – Low profile valves for inflation and deflation are protected very well, and they are durable. 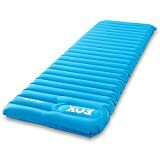 Fox Outfitters Airlite Sleeping Pad for Camping, Backpacking, Hiking. Fast Inflatable Air Tube Design with Built in Pump. This is a very good product for you to buy. What I like the most about this one is the thickness of the pad. When there is limited space in your car, this is one of the best solutions for you on a camping trip. In details, the tubular design will allow for superior packability while it provides an elevated sleep experience with infinite adjustability and unmatched support. In brief, with the small portable design, it can meet your needs, especially if you are a camper or any other outdoor enthusiast. With this product, it’s time for you to forget about having to blow a camping air mattress up manually. 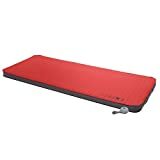 This is because the Airline sleeping pad features a unique integrated foam foot pump, allowing you to effortlessly and quickly pump the pad up. Also, there are no batteries needed. Furthermore, with double brass valves, this air pad can easily stand up to any camp floor. And when needed, the air flow will be maximized for effortless and quick deflation. – The foot pump mechanism can work very well, and it only takes you 1 minute to get the hang of it. – This mattress can stay inflated for a long time, so you don’t have to refill it often. – It can also fold up small, take up little space, thus, especially suitable for sleeping in cars. – The mattress is quite narrow. – The price is about 30% more than other camping mattresses of the same quality. First, I want you to know that what sets this NeoAir Dream Air Mattress apart from its counterparts is its great versatility. This product is honestly one of the best adaptable mattresses you can find on the market. The reason why people call it an adaptable one is that you can remove this inflatable mattress which comes inside the protective outer cover. Also, you can use this one separately as a lightweight backpacking air bed. Additionally, this car camping mattress features a foam pad to live inside the plush protective cover when used in “basecamp” mode. Besides the great versatility as mentioned before, this mattress can easily pack down into a very small package, and it is relatively lightweight. This feature is also what makes the mattress one of the most versatile products. That’s the reason why this mattress is commonly used for car camping. Furthermore, this one is also comfortable and pretty warm so it can protect you from the cold when sleeping outdoors. – This one can separate the inflatable pad. – It has small packed size. – Sleeping on this mattress will provide you great comfort as well as warmth. – It is quite expensive. – There is no stuff stack. As you can see, there are different things to take into consideration when you want to buy the best car camping mattress. They are a comfort, versatility, ease of use, and so on. I know that you may be overwhelmed a little bit at the beginning. However, if you read my article thoroughly, I’m pretty sure that you will know what to do. Hope you guys enjoyed it and found my information helpful for your next camping trips.